Not many people like interacting with crowds or other small groups. Those individuals who don’t like the crowds or small groups are mostly nervous during social functions. It can be very unpleasant and controlling when you are nervous in social gatherings. This nervousness is what is referred to as social anxiety. Social anxiety is the worry of interaction with other people, mostly a huge gathering. This situation will then bring about the feeling of being evaluated and judged negatively. It also causes a person to feel self-consciousness, and all these will make that person want to avoid public places. Other feelings that will be caused include humiliation, embarrassment, depression, inferiority, and inadequacy. It is not easy to realize if a person suffers from this type of anxiety or not. However, someone who suffers from this kind of anxiety will always feel something uncommon, but might not realize it. • Evasion of social gatherings. If you are the kind of guy who would try to avoid social gatherings, then you are most likely suffering from the condition. • Extreme anxiety in social groups. • Emotional distress when all attention is focusing on you. If one avoids the public and feels nervous when in a crowd, then they could be suffering from social nervousness. There are many ways to tell if you are socially anxious, and even though they are not very easy to notice, you can still rate them and know if you are anxious in public or not. 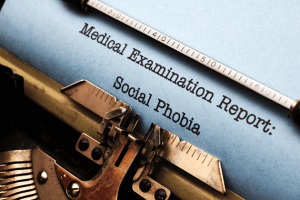 Taking a social anxiety test will help you evaluate yourself, and determine if you are anxious when in social situations. 1. Do You Have Physical Anxiety Symptoms When You Are In Public? If you tend to have such symptoms like stomach upset, uncontrolled sweating, pounding heart, shaking, muscle tension or blushing, then you could be suffering from social nervousness. Some people will naturally have a weird, and unsettled functioning in the body. There are some situations where some people might pee in their pants or even experience diarrhea. So if you have these symptoms, especially when at a social gathering, then you are most likely suffering from social nervousness. 2. Are You Afraid Or Edgy When Meeting A Person In Authority? Your boss is a person that has more experience at work, and also, they tend to be the expert in various fields. For this matter, some people will always feel tense to meet their boss. Usually, because they feel that something must be wrong somewhere. When such people meet someone big, or simply their boss, they tend to be nervy, which causes them to be overly worried. So if you are afraid of meeting someone in authority like a school head, a teacher, a public figure or even your boss, then you could be suffering from social fear. 3. Are You Afraid Of Meeting New People? Some people cannot wait to meet a new person, since they are great at making friends, and they love to meet new people. However, there are some who will try their best not to encounter new people, and if they do, they will feel uneasy, and even might sweat. A probable reason could be that these people might have a negative perspective towards themselves. As a result, they will believe that the new friend might find out about their perceived weakness. And therefore, one might use all the means available to them to avoid meeting new people. Because of that, if you have an edgy feeling when meeting new people, then you might be suffering from social nervousness. Learn to be more social. 4. Can You Walk In A Room Confidently After Everyone Is Seated? One thing that happens when there is a meeting or any gathering in a room is that anyone walking in will be the major center of attraction. For this, those with public fear will always feel reluctant walking in a room when everyone else has seating already. It could be in a meeting at work or a social event at a hall. What these people might believe is that people will be judging them while they walk into the room. It is always a natural effect that people will turn whenever anyone enters a room. But it is not always true that they will always evaluate the person coming in. So if you always feel reluctant when you should be entering a room with people already settled, then you could be having social anxiety. 5. Can You Keep An Eye Contact With A Person, Especially A Less Familiar One? Keeping eye contact is always advised, for the sake of proving that you are paying attention. Also, some believe that if a person doesn’t keep eye contact, then it implies that they are lying about something. Conversely, not everyone who avoids eye contact lies. Some people are afraid of keeping eye contact because they believe the person looking at them will notice the fear in them, or because they are shy. For this reason, some people will avoid eye contact. And for that, if you tend to avoid eye contact with people, mostly those you are not used to, then you could be suffering from social nervousness. 6. Do You Or Can You Express Your Disagreements With A Stranger? It is always not easy to show your disagreements with a person whom you do not know very well. However, it takes courage to express your disagreements. People tend to fear to voice their differences because they are afraid of the outcome. They believe that the other person might be offended, or they might think less of them for objecting to their ideas. It never hurts to say what is on your mind and express what you feel about the notion. But if you tend to swallow your thoughts and ideas, even if you believe that the other person or people are wrong, then you could be having social fear. It is always good to be confident, and be you, especially when at a social gathering. Doing this helps to solve issues of social anxiety. And with a social anxiety test like this, you will be able to know where you stand regarding having courage or fear when in a social situation.